Our swimmers are divided by ability into a number of squads forming a progressive scheme in which swimmers of similar ability train together. We also have fitness and masters (adults) lanes and a thriving Water Polo Section. The amount of water time varies according to the age and ability of swimmers from 30 minutes to 11 hours per week. We believe we are able to offer our swimmers more water time in the evenings than any other local club. Each squad has its own coach/teacher while the training programme is overseen by the Club Coach. Once in a competitive squad, we expect swimmers to train at least twice a week (3-4 times for older swimmers and 5-6 times for Elite Performance Squad). Swimmers are encouraged to achieve ASA stroke awards over sprint and middle distances. Our Fitness squad offers two sessions a week of 45-60 mins to able swimmers aged 11+ who cannot commit to full competitive training (temporarily eg school work commitments, or long term). 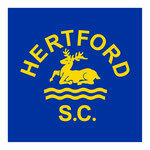 Most are from the other Hertford SC squads. All are encouraged to enter Club Championships and are eligible to enter open meets and for gala team selection. Some swimmers move back into competitive squads if a place is available and they are fit enough. Please speak to your coach or any Committee member if you would like to know more or contact us by email. Our Masters sessions for adults are held on Thursday evenings (19.00 to 20.00) at Hartham. We also have an arrangement with Hartham Masters Swimming Club whereby our members can swim with them on Saturday Morning. Our session is open to adults over 18y at date of joining. It covers a wide range of abilities from those wishing to develop their strokes over 25m, to regular fitness and competitive club swimmers. Training schedules are provided & guidance offered. If you are interested click here or email us at masters@hertfordsc.co.uk. Our Water polo team trains at Hartham from 21.00 to 22.00 every Wednesday evening and competes locally throughout the summer. We are always looking for new members (boys only 16+).